Hillsboro’s Gracie Dean surveys the floor from the elbow in this photo from the Lady Indians game against the Lady Blue Lions on Saturday, January 12, at Hillsboro High School. The Lady Falcons are 4-12 following the win over their former South Central Ohio League and Southern Buckeye Athletic & Academic Conference rival. 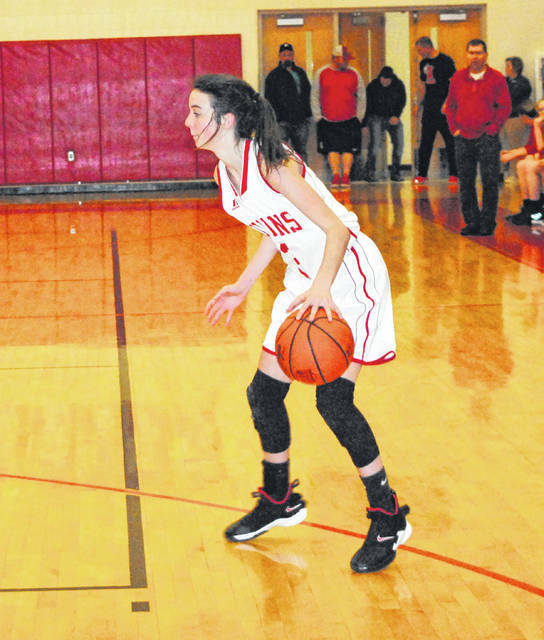 Karleigh Hopkins and Josie Hopkins scored seven points each for the Indians. Kayden Watson buried a couple of threes for six points. Hillsboro trailed 20-13 at halftime but Clinton-Massie pulled away in the third period for a 41-23 lead. HILLSBORO (fg-3fg-ft-tp) Burns 0-0-0-0 J. Hopkins 3-0-1-7 Grover 1-0-1-3 K. Hopkins 3-1-0-7 Cosby 0-0-0-0 Dean 2-0-0-4 Watson 2-2-0-6 Detrick 0-0-0-0 Bledsoe 0-0-0-0 Ja Moberly 0-0-0-0 Jo Moberly 1-0-2-4 Page 0-0-0-0 Edenfield 0-0-0-0. CLINTON-MASSIE (fg-3fg-ft-tp) McK Crawford 0-0-0-0 Cottrell 6-3-0-15 Ireland 3-0-3-9 Avery 3-0-0-6 Chowning 2-2-3-9 Lay 0-0-0-0 Mi Crawford 3-0-3-9 Voisey 0-0-0-0 Greathouse 0-0-0-0 Cranmer 0-0-0-0 Jaramillo 0-0-0-0 Wilson 0-0-0-0. Mark Huber is the Sports Editor for the Wilmington News Journal.